Some buses appeared in the rally came from far away. 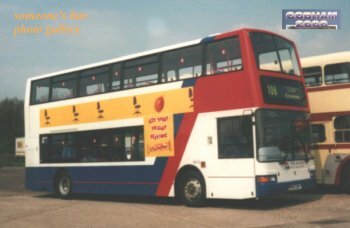 One of them came down from Birmingham and it was a Volvo B7L owned by Travel West Midlands (TWM) (Note: it took about three hours from Birmingham to the bus rally's venue!). 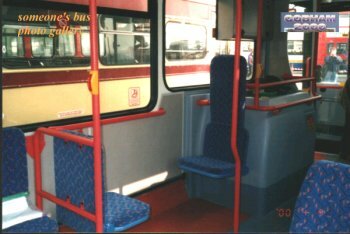 TWM is the major bus operator in West Midlands and famous with its substantial investments on new buses. Volvo B7L low floor double-decker bus is a kind of bus that they have bought for modernisation of their fleets. 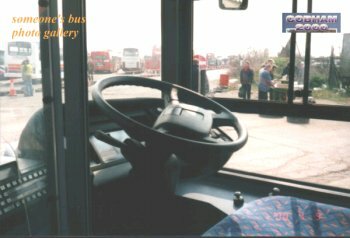 The appearance of TWM's Volvo B7L. It is with Plaxton President bodywork. This is the space reserved for wheelchair users on the lower deck. Folding seats are available so that the overall number of seats will not be reduced substantially because of the space reserved.